Last week, a shock poll of Spanish voters found that the Occupy Movement-affiliated “Podemos” (“We Can”), a new radical leftist party, is likely to sweep parliamentary elections. As Podemos snowballs into a formidable organization, facts have begun to surface about its leader, the host of an Iranian state television show who extolled Mao Ze Dong and justified working with terrorist groups. 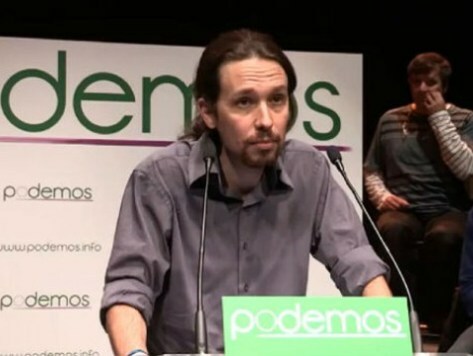 Pablo Iglesias, leader of Podemos, has repeatedly justified working with violent and extremists political entities, in addition to extolling the virtues of dictators such as Hugo Chávez, who bankrolled Podemos in part. Those justifications apply personally, as well, apparently, as the rising popularity of his party calls into question his negotiations with Iran’s Ayatollah Khamenei. Podemos, according to the latest polls in the nation, would soundly defeat Spain’s establishment leftist party, the Socialist Workers’ Party of Spain (PSOE). While it has not yet overtaken the conservative party (the Popular Party, or PP), many consider Podemos, which rose out of the ashes of Spain’s Occupy movement, an existential threat to the socialist establishment of the nation. Unfortunately, concern among the right in Spain has stirred up fascist elements in the political sphere, as well. Fascists in Valencia established a Spanish wing of the Greek neo-Nazi party, Golden Dawn, this week. Such a stir has triggered renewed interests in Iglesias himself and his willingness to work with a consortium of unsavory characters to make ends meet. For years, Iglesias has hosted a left-wing discussion program called Fort Apache on the Spanish-language Iranian network HispanTV. While HispanTV is geared toward a Latin American audience–something which Iglesias, as a Spaniard, is not–the network has provided Iglesias a platform for some of his most outrageous views. The content of the programming is as concerning as the fact that this programming exists at all and that Iglesias makes money off the Iranian regime. Many of his statements–including support for the terrorist Marxist Revolutionary Armed Forces of Colombia (FARC) and his bold-faced hosting of a chat on fascism on Iranian state TV–would easily lose any election for an American candidate, and even a Spanish candidate. Iglesias appears to be hoping that Spanish voters do not dig too deeply into Fort Apache archives to understand the ideology that drives Podemos. Iglesias received a chance to discuss Iran’s other major export besides fascism–terrorism–in a different episode from July 2013. The episode, titled “The Colombia of FARC: A Path to Peace?” features a discussion lionizing the work of the terrorist group, that, to this date, has killed between 220,000 and 600,000 people. Surely you have heard many times that one cannot negotiate with terrorists, or that only the instruments of the state can challenge an adversary. Believe me, this is nothing more than idiocy, property of cynics who do not dare to call things by their name. In politics, one negotiates with anyone with enough power to sit at the negotiating table. Here I recall the words of the astute Mao Ze Dong, who said that power is born out of the barrel of a gun, and so it is. Unfortunately, politics is often built over corpses and the suffering of entire people. Today, we talk of peace, which as we all know, is built on the results of war. There are countless hours of footage from this show, many likely to yield the same sort of incendiary rhetoric which creeps just at the border of what is legal in many European countries (which do not enjoy the same level of speech protection due to anti-fascist incitement laws). Fort Apache was born in 2012, when Iglesias’ fledgling media project, Left Hand Media, had lost so much money that Iglesias was forced to find deeper pockets to keep his ideas afloat. He found them in the government of Iran, which at the time was looking to fill up airspace on HispanTV and, apparently thinking all Spanish-speakers were the same, disregarded that Iglesias was not Hispanic, and made him one of the most prominent faces on the network. Reports indicate that Iglesias makes 3,000 Euros per program, 15% of which return directly to Left Hand Media. Politics is an ugly thing. It has a very pretty dimension about it: the red flags, the songs, the epic moments, those elements. It also has its gray parts that have allowed Hugo Chávez to create a leftist foreign policy to create leftist movement internationally. The key [for him] has been a thing called money, procured through a thing called petroleum. Who has been one of the fundamental allies of Hugo Chavez? Iran, which has contracted me on television, too–a state that murders communists, where women have to wear burqas, but politics is like this. Some people have to work for Coca-Cola or Walmart. As Podemos rises in the polls, the party must now choose whether to vote Iglesias as official party leader–not just symbolic figurehead–or find someone who better represents their ideals. Iglesias is expected to run away with the internal vote, a testament to his political ability as much as it is a testament to the voraciously Machiavellian ideology of the international Occupy movement, striving to amass power for power’s sake at all costs.